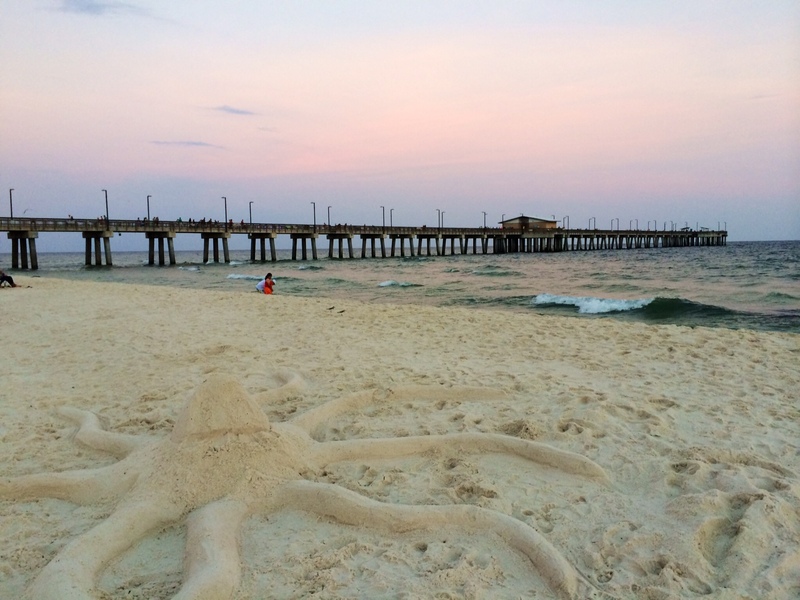 Ahhh, what a week at the beach can do for one's sanity. Restore it! Growing up, my mom, grandmother, and I would take a family vacation every summer. Everywhere from San Antonio to Disney World to the mountains. You name it, we went. My mom always had an agenda planned out with some "do anything" breaks along the way. As much as I enjoyed those trips, and as much cool stuff as I got to do, I've adopted a much more do-whatever-strikes attitude to vacations. Especially since I haven't been on a proper one in years, and David can't remember ever taking one at all. Hell, I haven't taken a vacation day since December of 2014. No wonder I'm so unpleasant as of late. 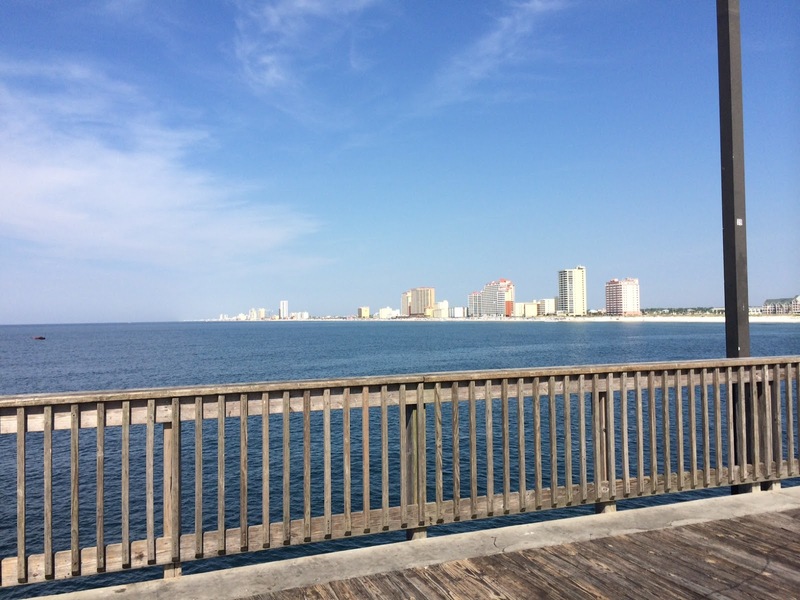 This past week's trip to Gulf Shores, Alabama was technically the second leg of our honeymoon, just a year and a half after the fact. We went into it with a list of possible activities, a prioritized list of restaurants (naturally), and the promise to do whatever we felt like doing. 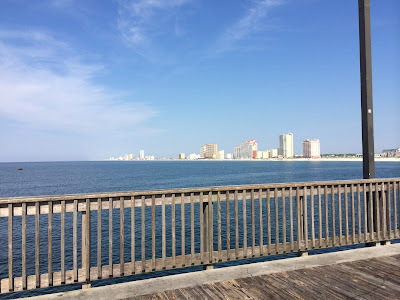 David wanted to hit up Fort Morgan for a historical tour, we booked a dolphin cruise, and we toyed with the possibility of visiting the Gulf Shores Zoo. 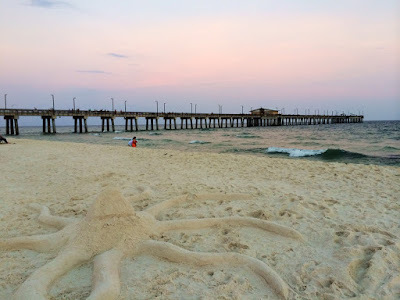 After our first evening on the beach, when I asked David if he still wanted to visit Fort Morgan the following morning, he replied, "Meh. I kinda just want to sit on the beach." For a landlocked Texan like me, that first view of the ocean after a long absence can be completely and wonderfully overwhelming. We decided to camp out in the sand, swim in the ocean, enjoy great meals, and we'd get around to...whatever. Our first day parked on the beach. 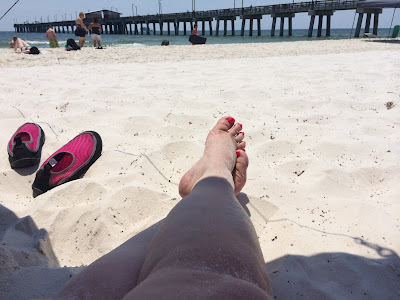 We took a little sport tent for shade, tethered it in the sand and sat, and swam, waded, lounged, dug for shells, took a turn in the pool, napped, dodged jellyfish, read, ate and planted ourselves on the beach some more. For a week. I could not have asked for anything more therapeutic after a challenging year at work thus far and a whole lot of grown up decisions on the horizon. The last day, the last beach selfie. Our last night sitting on the beach and watching the waves, I looked over and said, "I think I need to teach again," and he said, "I thought that might be the case." And there you have it. I'm planning to weigh my options: a return to the higher education classroom with limited options in the immediate area or an alternative certification graduate program to teach in our public schools. I feel lighter and righter already. Sounds like a great vacation! I'm definitely a fan of the "everyone does what they want to do" vacation mentality as well. And, nothing like a little clarity on life decisions to top things off! Amazing what those waves can do, eh? I made a similar decision about graduate school when I went to Oregon in July. All that fresh air and sunshine made me realize that I'm ready to take that next step. I swear it sounds like David was made just for you. I've been going to the beach twice a year with my mom and my sister and they want to go, go, go while we're there and I'd be happy just planting my tail and doing nothing. So glad you had a fun and relaxing vacation. Sometimes all it takes is a little reset to figure out what's missing, and what needs to go. I have such severe Wanderlust right now, and am not taking any exciting trips - Madison, WI and some cabin on Lake Superior with the in-laws. Looking forward to both, but I don't think they're going to scratch my itch, if you know what I mean. 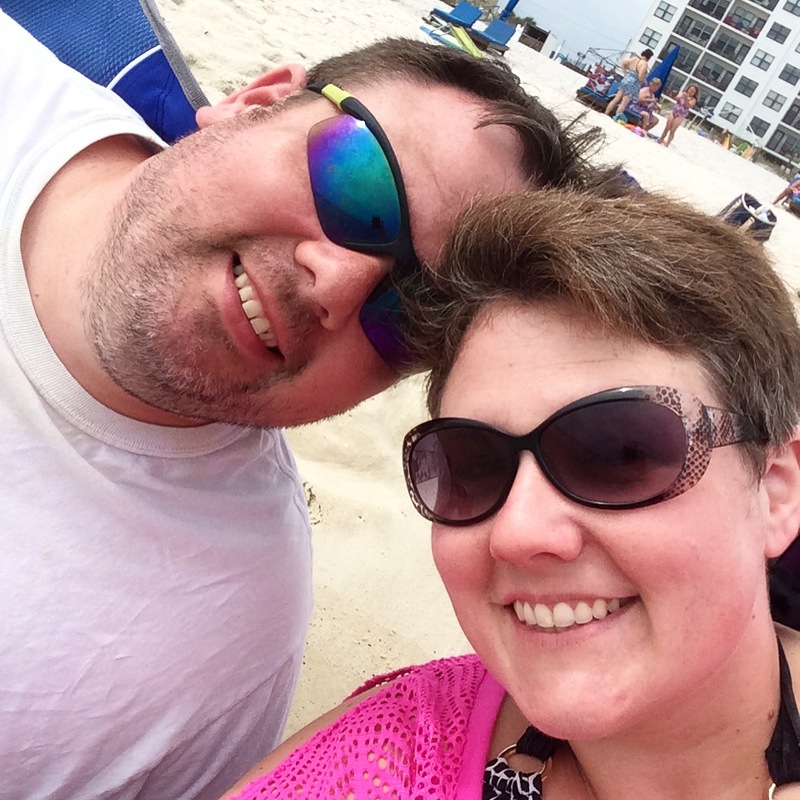 It's been a while since Kim and I have been on a vacation, but when we did go on one, it was like you and David. We just wanted to kick back and relax, with no worries...and for you, it sounds like part of that was making a big decision -- and I know from what you've expressed on Twitter and here, it sounds like it will be the right one. Good luck on your return to the higher education classroom. What a lovely vacation!!! Isn't it incredible how a little distance from our home life routines can help us have profound realizations? I wish you all the best on your journey to go back to teaching - following your heart is always the best idea! Would you believe I just heaved a huge sigh of relief? I'm not saying I knew you should teach, but now that you've made the decision I'm like, well duh! lol. I'm so happy about that decision. So happy. We were in Ft Morgan last year and had such a good time. We did end up going to the Gulf Shores zoo and it's fun though on the small side. The people were really nice and an employee in the reptile house took out a snake that the Tornado was looking at and let him touch it which was really cool. I'm sure you feel so much better having made a decision. For me that's always the hardest part no matter how hard what follows is. Good luck and have a great week! Excellent news! I think it's great that you want to return to teaching! I did alternative certification for high school English, and have been teaching for more than 13 years now. I've also taught English at the local community college (adjunct). High school jobs are probably easier to find, and often pay better. The benefits can be pretty good, too. And....summers off! More beach vacations! It sounds like your vacation was relaxing and rejuvenating in exactly the right way. Welcome back, and good luck with what's next! That sounds amazing! I'm so glad you got away for relaxation and time with the hubby and found some clarity along the way! It sounds like your vacation is just what you needed! So happy to hear that. Your vacation sounds much like mine, only we spent more time poolside with some shade instead of the beach. We had zero set plans, and it was so lovely, hitting the pool between 10-11 daily, talking, reading, just relaxing. Sounds like you had a terrific vacation :) Sitting on the beach sounds perfect to me. The older I get, I tend to just want to relax on vacation, instead of jam pack my days with sights to see. Plus, it sounds like you really got a chance to think about what you want to do next - good luck!! What a team! And what a relief to see some answers on the horizon. Sometimes it's just that moment of resolve you need for everything to look up. I'm so glad you had that, regardless of what happens next. And your trip looks amazing. I need, need, need one myself. Your vacation was so fun to watch on Instagram, and I admit that I am jealous. Our trips lately have been jam-packed and with other people. I absolutely *need* some time where we don't do anything but sit and enjoy the beach. As for life decisions, yay! I'll be cheering you on from Wisconsin as you move forward with a plan to get back into the classroom! Sounds like the perfect dose of reality break--sometimes stepping away from it all is the best perspective. Glad you had such a wonderful trip!! Love the last selfie at the beach! Hope the vacation feeling stays with you for a long while! Reading this post just relaxed me. The beach and water always do it for me. Good luck with going back into teaching. I went in another direction a year ago with the library after struggling for years to find my spot in teaching (I left to raise kids). I get that itch from time to time and am trying to figure out if I need to go back and take classes and teach in a different field. Can't wait to hear what you decide!! Congrats! It sounds like a huge weight has been lifted and, I must say, that the public school system would benefit greatly from someone like you. Amazing what a week of relaxing can do for a soul!